One of the most commonly encountered musculoskeletal injuries and possibly the most common injury in sports is the lateral ankle sprain. Current estimates suggest that one out of 10,000 people per day sustains an inversion ankle sprain with lateral ankle sprains accounting for 85 percent of all ankle sprains. Researchers have reported that approximately 20 to 40 percent of acute ankle sprains progress to chronic problems. Braun found that at six to 18 months after injury, 72.6 percent of patients reported residual pain after initially being treated in a general clinic. A study out of Hong Kong found that 59 percent of athletes with ankle sprains had significant disability and residual symptoms, which led to impairment of their athletic performance. Numerous studies on sports injuries have revealed a high occurrence and high recurrence rate of ankle sprain. Chronic pain, muscular weaknesses and ease of giving way of the ankle are not uncommon for athletes with a history of ankle sprains who subsequently develop chronic ankle problems and chronic ankle instability. The anterior talofibular ligament, the calcaneofibular ligament and the posterior talofibular ligament comprise the lateral ankle ligament complex. The anterior talofibular ligament is the most frequently injured ligament in inversion sprains followed by the calcaneofibular ligament and rarely the posterior talofibular ligament. Brostrom and Linstrand reported that approximately two-thirds of ankle sprains are isolated to the anterior talofibular ligament. The anterior talofibular ligament runs parallel to the foot in a neutral position, is contiguous with the ankle joint and is the weakest of the lateral ankle ligaments. The calcaneofibular ligament is an extra-articular ligament, which crosses both the subtalar joint as well as the ankle joint, and acts as the floor of the peroneal sheath. Lateral ankle sprains are often not isolated findings and are frequently associated with other injuries such as peroneal tenosynovitis, anterolateral impingement lesions, ankle synovitis, intra-articular loose bodies, osteochondral lesions of the talus and tibia, adhesions, fibrous bands, and neuritis. Researchers have found that chronically unstable ankle joints can lead to degenerative changes as well as peroneal tendon pathology. 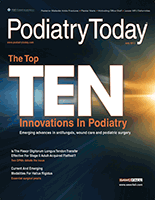 Dombek and colleagues revealed that 58 percent of peroneal tears in their study resulted from trauma and 61 percent of those were secondary to ankle sprains. Continued microtrauma and repetitive over-stretching of the capsule may take place with chronic ankle instability. Accordingly, this could lead to synovitis, synovial impingement and scarring of the capsule. Hintermann and coworkers evaluated chronic ankle instability via arthroscopy and found osteochondral defects of the talus or tibia in 55 percent of the cases, synovitis in 32 percent of the cases, synovial plica in 10 percent of patients, and ventral scarring in 5 percent of patients. Ankle instability may be defined as functional or mechanical. Functional instability is the subjective feeling of giving way of the ankle joint with the etiology being a proprioceptive disorder secondary to previous ankle injury resulting in motion beyond voluntary control but not exceeding physiologic range of motion. Proprioceptive exercises along with peroneal muscle strengthening are successful in treating functional instability. The objective measurement of instability or motion beyond the physiological range of motion is mechanical instability. One may use the anterior drawer and talar stress tests to quantify the degree of mechanical instability. At the University Foot and Ankle Institute, we have termed the lateral ankle ìunhappy triadî as a combination of findings that frequently occur together: ankle instability, ankle synovitis and peroneal tendon tear.11 Frequently, clinicians make a single diagnosis based upon the mechanism of injury and when this diagnosis is incomplete, it may lead to suboptimal treatment. Accordingly, one would see incomplete healing, chronic pain, swelling and recurrence as a result. Common threads among patients with prolonged pain, swelling and instability of the lateral ankle are chronic ligamentous tears with associated peroneal tendon pathology ranging from tenosynovitis to tendinosis and ultimately tendon tears. Chronic tendon tears may result from repetitive activities in the presence of chronic ankle instability. The additional excursion available at the ankle joint over time can lead to synovitis and anterolateral fibrous bands. Treatment begins with a thorough history and physical. Typically, patients will present with a history of single or multiple ankle sprains, persistent pain and/or swelling, and a sense of instability in the ankle. Localized edema tends to be present about the anterolateral ankle joint and sinus tarsi regions, overlying the anterior talofibular ligament. One can appreciate point tenderness directly over the injured ligament(s) and tendon tear. Stress maneuvers of the ankle are key to incorporate in your workup. The anterior drawer test evaluates the strength of the anterior talofibular ligament. Increased anterior migration of the talus on the tibia is a strong indicator of the presence of a tear or attenuation of the anterior talofibular ligament. Imaging studies begin with weightbearing radiographs of the foot and ankle to rule out other pathology. We highly recommend stress radiographs such as the anterior drawer and talar tilt images, and one can compare them with the asymptomatic contralateral side. Magnetic resonance imaging (MRI) can rule out osteochondral lesions and is sensitive as well as specific in detecting pathology in the lateral collateral ligaments and the peroneal tendons. However, MRI is less consistent in identifying synovitis, fibrous bands and small loose bodies. We implement non-surgical care in all cases prior to surgery, including brace immobilization and physical therapy for a minimum of three months. When pain perseveres, surgical treatment consists of a combination of ankle stabilization, ankle arthroscopy and peroneal tendon repair. All cases begin with ankle arthroscopy including debridement of synovitic tissue, fibrous bands and loose bodies. We follow this with an open technique for lateral ankle stabilization and peroneal tendon repair. Postoperatively, we have the patients use a non-weightbearing cast for six weeks followed by a below-the-knee controlled ankle motion (CAM) walking boot for an additional two weeks. At week six, the patient can start physical therapy and at week eight, patients can transition out of the boot into a tennis shoe with an ankle brace. One can allow a full return to athletic activity at three months. At our institute, we have found excellent results with diagnosing and treating the lateral ankle unhappy triad. Our patients have reported resolution of pain and return to normal activity with significant improvement in the ability to walk on uneven surfaces. Patients return to full function with few to no restrictions. It is our belief that heightened awareness and effective diagnosis of the lateral ankle unhappy triad will aid clinicians when considering possible combinations of injury. A meticulous workup of the patient may assist in uncovering subtle changes that occur in the company of chronic ankle instability. 1. Kannus P, Renstrom P. Treatment for acute tears of the lateral ligaments of the ankle. J Bone Joint Surg Am. 1991;73-A(2):305-312. 2. Saxena A, Luhadiya A, Ewen B, Goumas C. Magnetic resonance imaging and incidental findings of lateral ankle pathologic features with asymptomatic ankles. J Foot Ankle Surg. 2011;50(4):413-415. 3. Ferran NA, Maffuli N. Epidemiology of sprains of the lateral ankle ligament complex. Foot Ankle Clin. 2006;11(3):659-662. 4. Safran MR, Benedetti RS, Bartolozzi AR III, Mandelbaum BR. Lateral ankle sprains: a comprehensive review part 1: etiology, pathoanatomy, histopathogenesis, and diagnosis. Med Sci Sports Exerc. 1999;31(7):S429-437. 5. Schafer D, Hintermann B. Arthroscopic assessment of the chronic unstable ankle joint. Knee Surg Sports Tramatol Arthrosc. 1996;4(1):48-52. 6. Braun B. Effects of ankle sprain in a general clinic population 6 to 18 months after medical evaluation. Arch Fam Med. 1999;8(2):143-148. 7. Yeung MS, Chan KM, So CH, Yuan WY. An epidemiological survey on ankle sprain. Br J Sp Med. 1994;28(2):112-116. 8. Brostrom L. Sprained ankles: anatomic lesions in recent sprains. Acta Chir Scand. 1964;128:483-495. 9. Linstrand A. Lateral lesions in sprained ankles. A clinical and roentgenological study with special reference to anterior instability of the talus. Dissertation. University of Lund, Lund, Sweden, 1976. 10. Dombek M, Lamm B, Saltrick K, Mendicino R, Catanzariti A. Peroneal tendon tears: a retrospective review. J Foot Ankle Surg. 2003;42(5):250-258. 11. Franson J, Baravarian B. Lateral ankle triad. Clin Podiatr Med Surg. 2011; 28(1):105-115.